Facing backward, Baby #3 sees his sisters in their car seats and doesn’t seem to question being buckled in among them—most of the time. His big sisters also help entertain him both in the car and during road stops when he burns off energy trying to keep up with them. Still, spending miles and miles in the car can get to any little traveler, whether he’s got siblings in the car or not. Here are a few easy ways to help keep yours happy in the car on your next road trip. 1. Decrease the recline of your rear-facing car seat. Though infant car seats often show levels to help install at the recommended 45 degree angle needed for a newborn and young infant, older babies who have good control of their neck muscles no longer need to ride in such a reclined position—in fact, if you watch you may see your child straining her neck muscles to lift her head up from the position and get a better look around the car, and possibly out the window. Hours of that can get exhausting. According to the American Academy of Pediatrics, you can decrease the recline of your rear-facing car seats for toddlers and babies with stronger necks to 30 degrees. 2. Get a (sippi)grip. 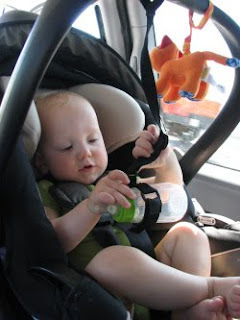 During summer road trips especially, it’s important for everyone to stay hydrated—especially babies, who become dehydrated much more quickly than older children and adults. But sippy cups and bottles seldom stay at their passenger’s seat. I like the SippiGrip strap to help keep bottles and cups with the kids, and as you can see in the photo above it also helps provide entertainment in some cases. Filled with cold water, it wasn’t a problem when Theo discovered he could douse himself as we drove through some very hot areas. Attached to a SnackCatcher, he was also able to feed himself puffs as we drove. As you can imagine, the SippiGrip also works well with toys. 3. Keep company. If you don’t have other children to keep baby happy in the back seat, take turns with your partner between driving and riding in the back seat with him. Your rear-facing baby will appreciate the company as you read, play, sing, or simply are within his view, and the driver will no doubt appreciate having you back there to attend to his needs while he focuses on the road—and possibly an audio book. For more help planning your road trip with baby, from pacing your journey to surviving car sickness, and from dealing with diapers to renting campervans… see Part 4 of Travels with Baby. Giveaway in progress: Win a Go Hybrid portable car seat ($199 value)! Ends 8/11/10. Good advice on the rear-facing seat. We switched our 14-month-old daughter to forward-facing just before our road trip to Sedona and it was wonderful! She was so excited to see mom and dad and what was going on outside the car. Heartiest Congratulations for your award-winning travel guide.. Thanks for some GREAT tips on keeping your baby cozy and smiling when out on travel expeditions! If you get a chance, please stop by my blog…it’s got a lot of information about Vacation Ideas to get the most out of your travels!